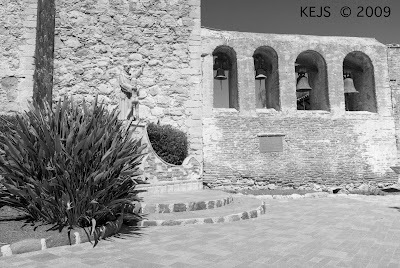 Given the response to last week’s posting, I decided to pull out my San Juan Capistrano B&W images. However, I haven’t actually printed these yet. So you are seeing the ‘best’ of my scans directly from the negatives. 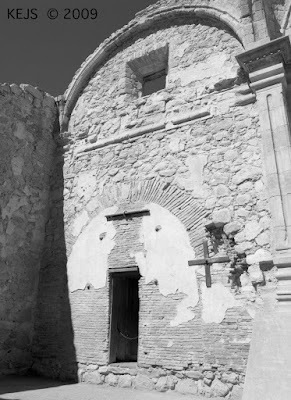 Since I could not photograph inside the present Mission Church, I spent most of my time in the Original Mission Church Ruins, begun in 1797 and destroyed by an earthquake on December 8, 1812. 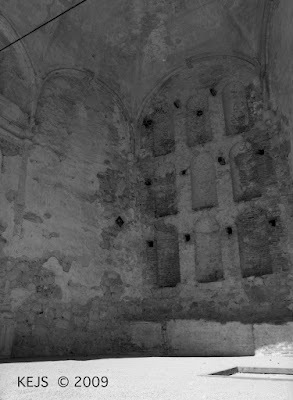 Ruins lend themselves to B&W anyway. 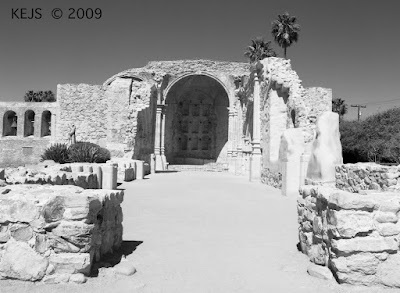 Often in a very hectic and busy American tourist spot you can have the ruins all to yourself, even with hundreds of other tourist around. Here I learned a long standing photographic truth: if you set up a tripod and look like you are a serious photographer, all of the tourist will flock around to see what you find so interesting (because maybe they should photograph it also). I’ve labeled that ‘special’ photograph below. 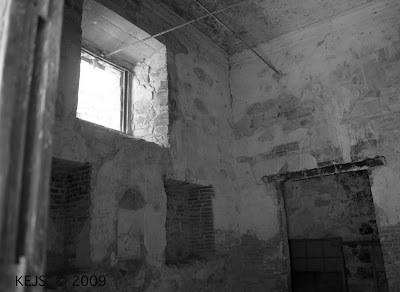 It was an empty grain storage room. I was attracted to the light coming through the window. The dozen or so people that found it necessary to ‘climb over me and the tripod’ to take a peak inside were sorely disappointed. I enjoyed the looks on their faces as they walked away confused. 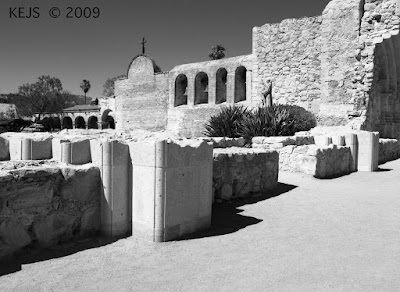 When visiting the California Missions, don’t be surprised or disappointed if you don’t get inside. 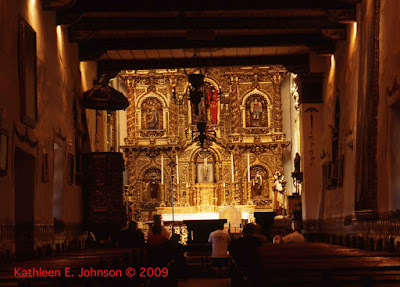 These are active Roman Catholic Churches and as such, there may be a wedding or some other event. 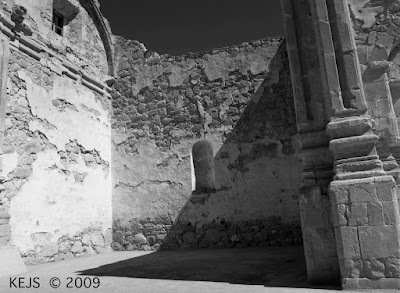 I also didn’t get to photograph much of Mission Santa Barbara for the same reason. But in this case, I think the runs turned out to be much more interesting. A higher resolution would have taken a ‘million years’. 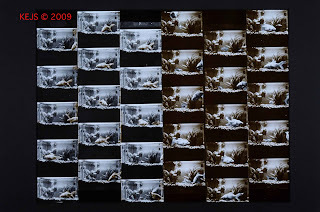 I use these scans (usually at much lower resolution) as my contact sheet. 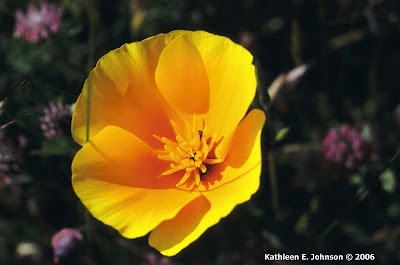 For the brightest white with details preserved, always use a deep yellow filter! The inspiration for my Urban Landscapes began with a Photo Workshop called 'Urban Disturbance' offered by WWA, and taught by Chris James. This workshop also inspired my "Denver Drive By" series. I'll be posting images from both series over the next few weeks. 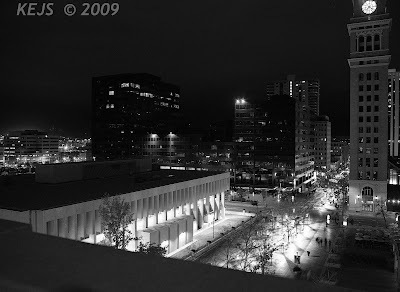 Shown Here two scenes from Downtown Denver. I can't say enough about what the Kennedy Family means to me. As Senator Kennedy's illness progressed I tried to imagine my life without Him in the Senate. Unfortunately my first vivid childhood memory was JFK's Funeral. And like many African American Families, we had the triptych of JFK, RFK, and MLK hanging on our Livingroom wall. I remembered that I really didn't need to shoot new photos for this comparison. Donald and I have been in the same places photographing the same flowers ad nauseum for our wild flower and gardening collections. 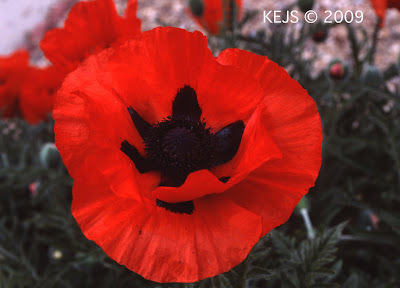 And I just happened to have Red Poppies and Red Tulips from my garden that we have both photographed recently. 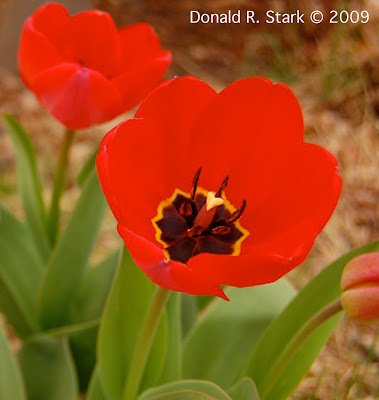 I'll dig further into our archives for purple flowers, but lets start with Red. 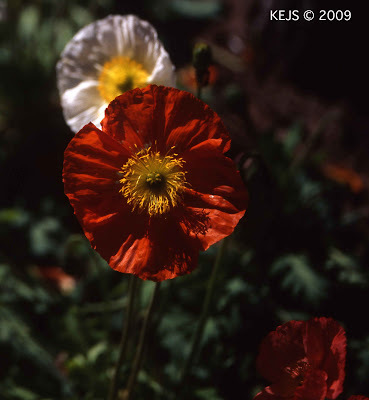 I think that the results are interesting, and yes, film renders RED better (as in more accurately) even with the color distortions introduced by scanning! 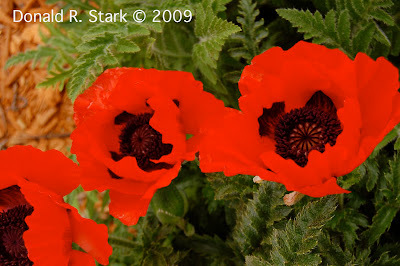 Unfortunately the contrast in color balance is not as strong for the Poppies because it is an orange-red to begin with, so the difference here is more subtle. You'll have to trust me when I say that the film (my image) is closer to the real color than Donald's digital image (I didn't do any color or contrast corrections). My greens are also truer to the actual foliage. With a richer, darker red we see the obvious difference! 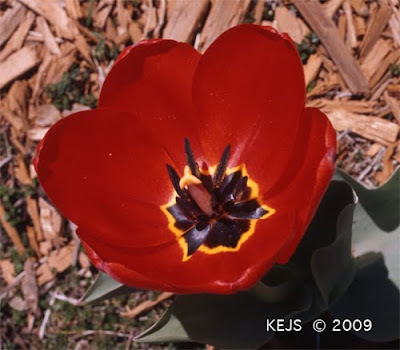 Can't believe that it is the same Tulip can you? Digital does make every RED more Orange-Red. The richer the red, the worse the problem. And again the foliage color for the film is also more accurate. So just be careful when you are photographing richer darker reds. 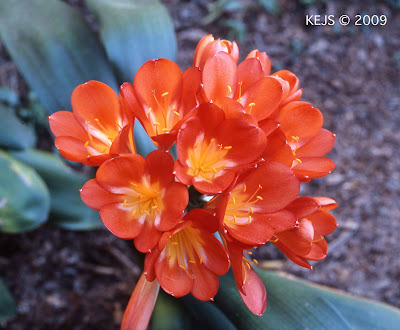 For example, I can see that this would be a real problem when photographing crimson! There are software corrections available for Nikon cameras. I'm not sure about the others. Yes the one famous for Swallows (and the movie Vertigo), no the swallows were not there when we visited. But it is close to San Diego and so we went during one of our visits to the in-laws. The main church was closed for a special event, but this lovely sunlit Chapel was a quiet space reserved for the faithful for daily prayer. 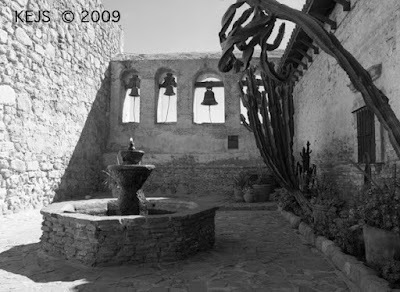 The remaining scenes are from the courtyard and environs. I’ll have a separate posting later for B&W. 'The Truth Shall Set You Free"
I've reorganized my table of contents a bit. 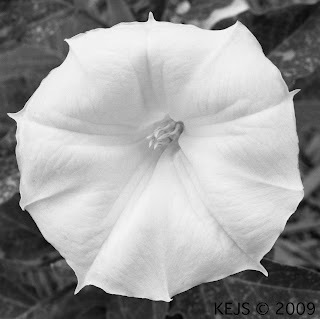 I wanted to recognize the Blogggers with whom I have a regular commentary correspondence. I follow too many Blogs (32 at the moment) to want them all listed here, and my interest in them all isn't equal. I will be gradually adding to this list of special contacts as time goes on. Ken Rockwell has recently brought to our attention the problem of Rendering Reds (and Purples) in digital format. Apparently, Red takes on an orange cast in digital, even if you are photographing something that is cherry red or fire engine red (two shades of red that are definitely NOT orange). He shows us examples of 'Film Reds' in his Gallery, but no direct comparisons. 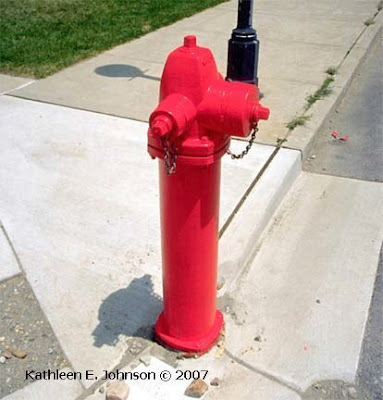 So I am going to undertake my own side by side tests of Red and Purple on Film and Digital, because it would really be too bad if Digital turned this fire hydrant orange-red. Results will be posted shortly. Of course there are a number of ways to consider Whole Roll, Single Subject. My previous discussion described making a photo mosaic of sorts., and by far that it my favorite approach. 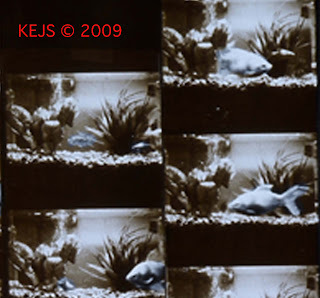 But I have tried an alternate method:, as demonstrated to the left: 30 Minutes in the Life of a Goldfish literally is 30 minutes of photographing my fish tank (about 1 shot per minute). This required two rolls of 120 film shot in my Mamiya 645. The second roll was preloaded and ready to switch out in seconds. The finished image was printed on 11X14 paper and selectively toned to highlight my largest goldfish, 'Big Tail'. 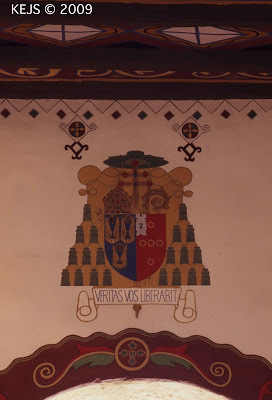 A detail in shown below. Faith on Film: Spiritual Cliché? We are all familiar with the clichéd Sun Beam as sign of the Spirit. But sometimes these really are spiritual places (and the Sun Beam just fortuitously appears). 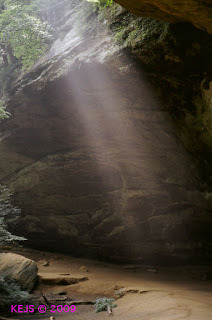 Such was my experience in the Hocking Hills. 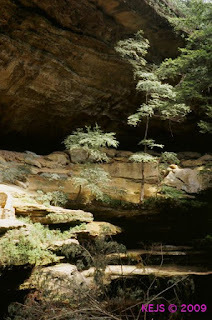 This is a region first inhabited by Paleolithic Natives down through time to the Shawnee. 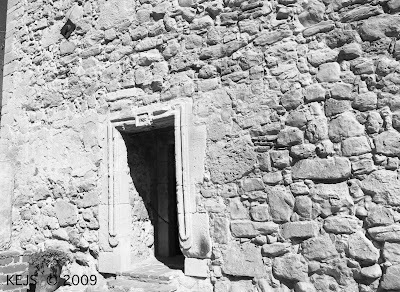 It was always a special place of refuge, and if you take your time, you can feel the presence of the Ancients as you wander through. 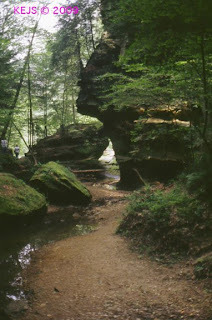 The Old Man's Cave area is a canyon within the Hocking Hills containing a number of rock shelters used by Native Americans. 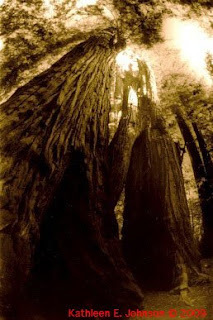 One of my photo influences, Donald Anderson has a Landscape Portfolio of this area. We've both taken a shot of the same location. 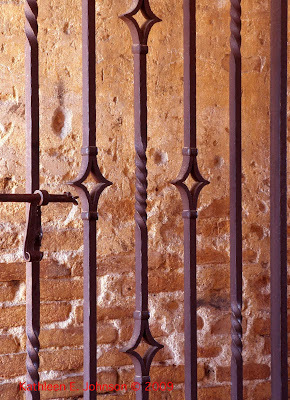 See if you can pick the 'duplicate' image. Here is the Profile of the "OLD MAN" that the area is named for. 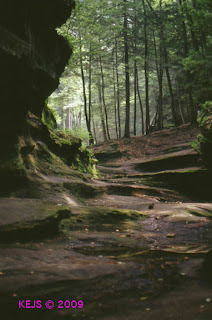 One of the Rock Shelters within the the small canyon of the Old Man's Cave region. Rock "Stairway" leading out of one of the many rock shelters within the canyon. So I’ve decided to continue the theme of Friday Commentaries. Today, ‘Support Your Locally Owned Film Processor’. I’ve previously written about using and processing FujiFilm Superia 400 and 800, and the Costco vs. Walmart processing dilemma. Basically Costco has stopped selling the film and will stop processing when their machines need updating. Walmart only has regional processing centers for film and it can take up to a week to get your processed film back unless your local Walmart is one of these processing centers. Plus the quality control for both Costco and Walmart can vary widely. Now you know that I am really an E-6 slide film person, but I do need the faster film speeds for my Plastic Cameras. I especially like the Superia 800 for this purpose. So why not just use my Locally Owned Film Processor. Most of these operations cater to professionals and will still be there for the long-term. Sure prices may go up a bit, but they will be there for you, next week, next month, next year, and for years to come! So use their services and keep them in business. Because the cheapest becomes the dearest if you let them die and the big box stores let you down! I usually process my own B&W. But when I have many rolls (say more than 4) I can Trust PhotoCraft. We’ve all seen the dramatic effects created with fisheye lenses. I have one for my Minolta cameras, and my Lomo, but do I really need a fisheye for my medium format Mamiyas? Probably not! 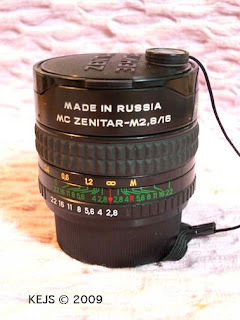 About five years ago I found a reasonably priced fisheye option, the Zenitar, a Russian made lens. First I was skeptical that the lens would actually arrive in one piece. I had paid through PayPal, but the lens had to be shipped from Ukraine. It arrived fine, and works well. 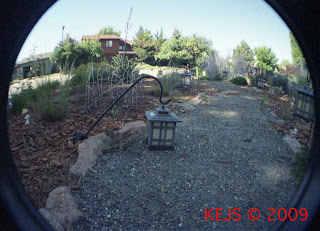 But although I had always wanted a fisheye, I’ve used it less than a dozen times. It is really a novelty item. But I didn’t pay exorbitantly for it, and it is there when I feel like going a little crazy. 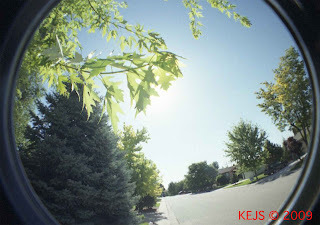 The results are far superior to any Plastic Camera, but if you just want to take a spin around the fisheye, try the Lomo. So here 'we' are at last Friday's Show Opening. Me and Weston Beach. 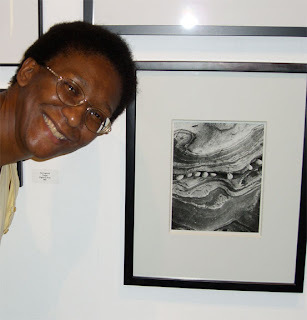 I was informed that my photo was the ONLY Silver Gelatin Print in the show. When the assistant director heard that there was 'one' she immediately knew that it was mine. Hmmm....... There used to be more of us. Last year at least a dozen or so. What has happened? No the others haven't stopped working in film, they have just stopped active participation in this organization. I've met a few at other venues and they have simply fallen away. 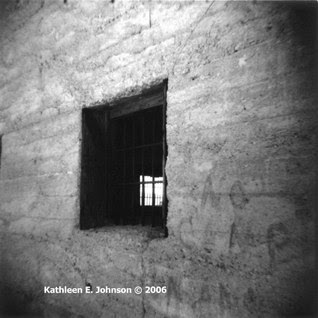 Of course it is hard to work with a group that allows instructors to ban film cameras from some of the workshops. For example, I wanted to take the architectural photo workshop, but can't, because it is digital only. Now when I visit George Lepp's website I'm expecting it to be digital only, but my community arts program should be a little more open. My membership is due for renewal, and I'll give them one more year, but after that????? Actually a type of Self-Portrait, taken by using the timer on my camera (and yes, the always handy tripod). 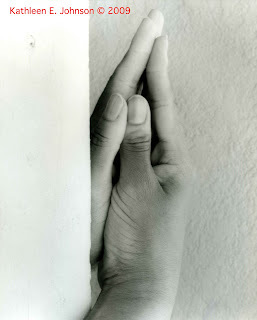 I framed the positioning of my hands by using the grain on the wood beam. Just something very simple as I was experimenting around the house. P.S. I was shooting another ‘whole roll, single subject’, in my front yard the other day. My neighbors think I’m Crazy. I’ll have the results when my darkroom is finished later this month. 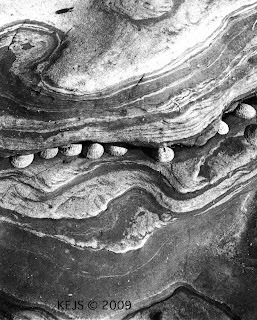 To see the rest of the Series Photos visit 'On Weston Beach' in my Website Photo Archives. 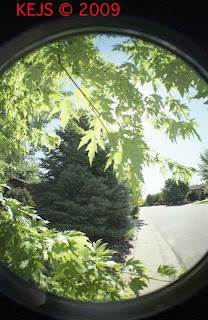 I was inspired by Natalie’s Sycamore leaf to photograph my own maple tree, but with a twist. 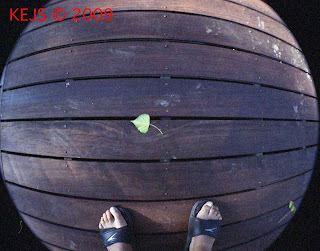 Rather than copy her macro technique, I decided to use my Lomo Fisheye. Well, my maple leaves proved not to be so photogenic, but I ended up with some interesting shots. 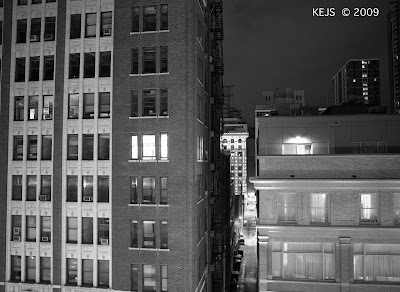 And you can see how well this ISO 800 film performs. I need to learn to keep my feet out of the frame, but with a rangefinder that can be tricky! I love Church Architecture! 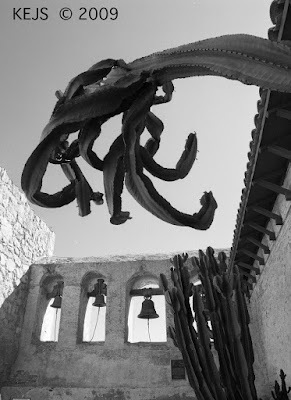 So I have a lot to draw upon as I start this series on my experiences photographing inside churches and their environs (as well as other spiritual places and symbols). 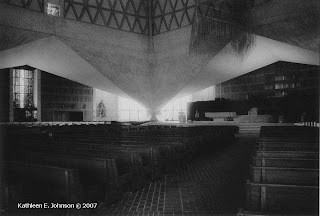 Older images will be color and mostly ENC-II film; Recent images will be primarily Ilford Black and White Film, like today's example: St Mary's Roman Catholic Cathedral in San Francisco. This IS the Cathedral on the famous Cathedral Hill. An 11X14 print on warm tone paper, taken from the Whole Roll, Single Subject Mosaic (July 29th Posting). 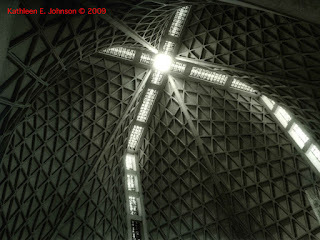 And A view of the Cathedral Dome. Also Printed on warm tone 11X14 paper.